Let’s consider the term “Asian American” as a poetic act: a new term reshaping the world by naming. It’s only a fifty-year-old idea—before then we were “Orientals.” The anti-war, Black Power, feminist, and Marxist movements of the day inspired students in the Bay Area to take up the new term “Asian American” both to mark their political awakening and to form a coalition across race and nationality. Those students sparked a nationwide Asian American movement, a long decade of art-making, organizing, teaching, and radical politics. 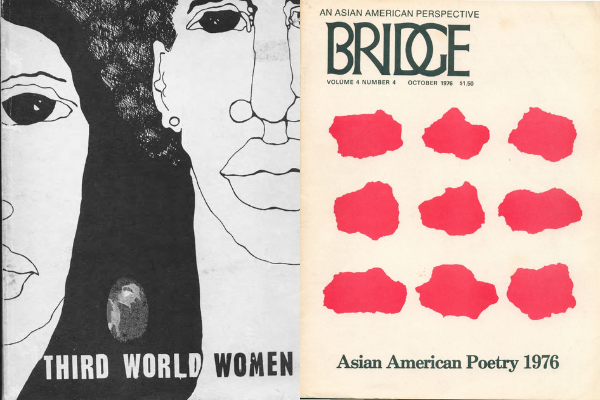 Poetry offered Asian Americans a form to voice generations of repressed emotion, to connect history to the present, to hold multiple languages and hybrid Englishes, and to expound politics. Their formal experimentation was voracious, drawing upon Beatniks and Baraka, Wang Wei and the Little Red Book, haiku and spoken word. Their theoretical concerns included Third Worldism, critiques of capitalism, sexual politics, internalized and overt racism, and bridging diasporas. The Asian American movement provided a radically open forum for people to step into art-making. There was often no line between poet and activist: poets ran non-profits, drafted Asian American studies syllabi, and ran youth programs. Some of those first-generation Asian Americans have gone on to reshape contemporary literature—Kimiko Hahn, Jessica Hagedorn, Arthur Sze, Garrett Hongo, Janice Mirikitani, Marilyn Chin, and Lawson Inada, to name a few. Many others published poetry only once or twice before finding their callings in other work. The early Asian American movement was primarily people of Filipino, Japanese, and Chinese descent, reflecting historic Asian communities in urban centers. Fifty years later, Asian America has changed completely, encompassing South and Southeast Asian, Arab, Muslim, Middle Eastern, and Pacific Islander identities. As in its early days, it makes sense only as a coalition, a political term. Jessica Hagedorn — "Canto de Nada/Para ti, M'wandishi, Smokey's Gettin' Old"
Janice Mirikitani — "Year of the Hat," "Too much to Require"
Wing Tek Lum — "I Did Not Understand," "Chinese New Year"
Lawson Fusao Inada — "Making Miso"
Presco Corpuz — "Tabios," "Mandan Ta Yon"
Joselyn Ignacio — "Manual At The I-Hotel"
Garrett Kaoru Hongo — "And Your Soul Shall Dance," Gardena, Los Angeles"
Mei-Mei Berssenbrugge — "Breaking the Circumference," "Numbers of the Date Become the Names of Birds"
Ask one of your relatives about your family history. Use their answer, whether facts, story, or silence, as the beginning of a poem. Draw your family tree, noticing the areas where you know more and less. Choose one of the blank spaces in that tree, and write into it. March in a rally. Use some of the words you see or hear—from a chant, a picket sign, a speech, or a flyer—as the kernel of a poem. Ryan Lee Wong is a writer and arts organizer based in Brooklyn. He curated the exhibitions Roots at the Chinese American Museum and Serve the People at Interference Archive, both focused on the Asian American Movement. Wong has served as a Visiting Scholar at the A/P/A Institute at NYU, a Visiting Critic at RISD, Assistant Curator at the Museum of Chinese in America, and an exhibitions administrator at the Metropolitan Museum. Ryan is currently a MFA candidate in Fiction at Rutgers-Newark, and serves on the Board of the Jerome Foundation.